Chandigarh 31st December:---- Prof. Yogesh Chawla, Director PGI honored nine officers/officials on their superannuation today by presenting mementoes to them. Sh Chetan P.S.Rao, Deputy Director and Mr Sushil Thakur, Financial Adviser handed over beneficiary cheques comprising GPF, gratuity and group insurance. The respective Heads of Departments wished them well in life by presenting bouquets to them. Smt Aleyamma, Sr. Lab Technician, Department of Medical Microbiology;.Pardeep Kumar Sehgal, Junior Store Officer, Engineering Workshop; Ram Chand, Assistant, Department of Psychiatry; Shri Krishan, Technician Grade II, Engineering Biomedical; Om Parkash, Technician, Grade III, Electrical Section, Engineering Department; Sukh Lal, Steward, Dietetics Department; Kalwa, Work Attendant, Engineering Department; Sulender Pal, Sewerman, Grade-I, Engineering Department and Ram Krishan, Sanitary Attendant retired from PGI after devoting 20 to 34 years of their lives to PGI. 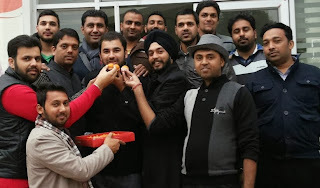 Chandigarh 31st December:---- Immigration especially to Canada is sought after by North Indians, mainly Punjabis. A business route is available to the cash rich Punjabis for migrating to Canada on an Investor Business Visa. In the last year or so various unscrupulous agents/consultants have been spreading rumours that the Canadian Investor Visa applications have been stopped by the Canadian Government. Putting anxiety and fear in the minds of those who have applied for the said visa or those who have planned to apply for one. Kuldip Singh, a prominent Advocate in this field since 1970, a leading authority on taxation, immigration and business law, has come forth and given a statement voluntarily to allay fears of the people in this regard. He said,that these rumours are absolutely false and are being spread by unscrupulous agents for their own vested interests in the Northern Region. He has further elaborated that the true and legal fact is that the Canadian Government has only temporarily suspended accepting NEW applications (w.e.f. July 1st 2012) and this suspension has no-effect whatsoever on applications already under process and which are pending with them as on 30th June, 2012. As of July 1, 2012, we are not accepting federal Investor applications for the time being. This is, so, we can focus on processing the applications we already have and review the program.This pause on new applications will go on until further notice. It does not apply to the Quebec Immigrant Investor Program. "(Refer to www.cic.ca.english/immigrate/business/investors/index.asp)"
Mohali 31st December:-- In winter, vitamin D level could fall into the deficiency zone thus increasing the risk of illness, cancer, and other health problems. It was an essential co-factor in the prevention of diseases from cancer to diabetes, dementia and cardiovascular disease. It could also effectively shield us from the common cold and influenza during winter months." This was stated by Dr Harinder Batth an Orthopedic Surgeon at Dashmesh Orthopedic and Trauma Center (DOTC) , Zirakpur while speaking during a seminar on 'How to maintain Vitamin-D level in winter' held at DOTC today. He said many current guidelines for Vitamin D levels were inadequate because they only were taken into account what was needed for bone health, and would leave us susceptible to cancer and many other chronic diseases. Dr Batth said self medication of vitamin D without medical advice could be dangerous, warned Dr Batth. Vitamin D toxicity, also called hypervitaminosis D, was a rare but potentially serious condition that occurs when you have excessive amounts of vitamin D in your body. Vitamin D toxicity was usually caused by megadoses of vitamin D supplements — not by diet or sun exposure. That's because your body regulated the amount of vitamin D produced by sun exposure, and even fortified foods did not contain large amounts of vitamin D, pointed out Dr Batth. The main consequence of vitamin D toxicity was a buildup of calcium in your blood (hypercalcemia), which could cause symptoms such as poor appetite, nausea and vomiting. Weakness, frequent urination and kidney problems could also be occurred, said Dr Batth. Beyond supplements, sensible sun exposure could also be safely used to further increase vitamin D levels for optimal health. Explaining importance of sunshine in getting Vitamin D, Dr. Batth said that the sunshine vitamin was a critical part of our evolution as it has been circulating in our ancestral blood for countless generations due to plentiful sun exposure. Mohali 31st December:-- The students of Indo Global Colleges distributed woolen clothes to needy & under privileged people. 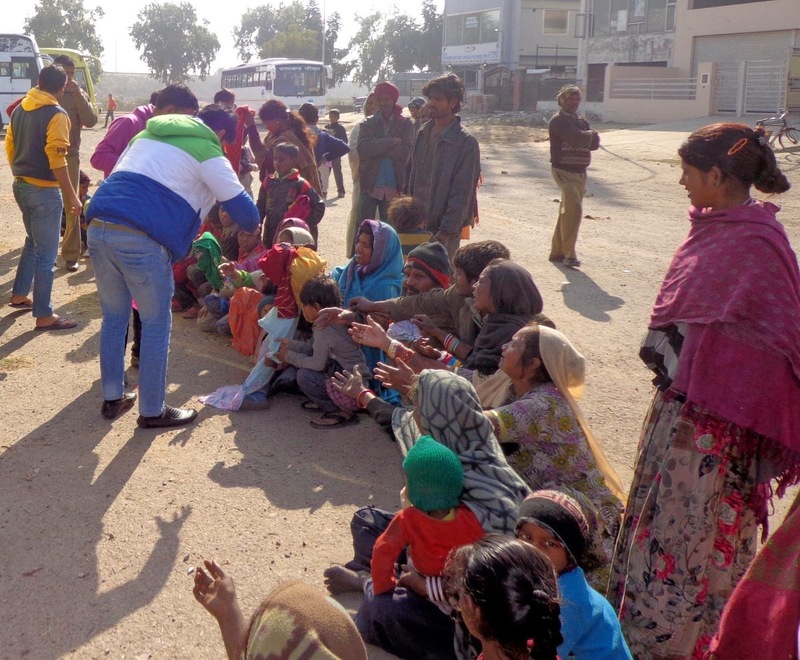 Distribution was started from Leprosy Home, later lead to the slum areas around Jagatpura Colony where people thronged to receive them. Arman and Dilbagh Singh, Civil Engineering students of Indo Global Colleges along with their team of more than 100 engineering and MBA students of Indo Global Colleges involved in the project. The students have placed drop boxes in Housing Colonies in various Sectors, in Temples, Gurudwaras and even at many shopping outlets.The general public is motivated through advertisements and pamphlets to distribute generously. Dabur and Videocon are also actively supporting project. Panickar, Director General, Indo Global Colleges said that this drive will continue till mid of January & was commenced on 15 December .Over 3 full bus loads were distributed to the poor. According to him the next distribution drive is scheduled on 4 and 6 January 2014. Neelam Singla, Chairperson of Indo Global Colleges said that while everybody is planning New Year celebrations but students of Indo Global are busy in this noble cause. She motivated the students that the clothes must be checked, cleaned, folded and segregated into various groups like Children – Boys, Girls, Youth, Men and Women according to sizes. This is the fourth consecutive year that Indo Global Colleges is conducting this noble activity. 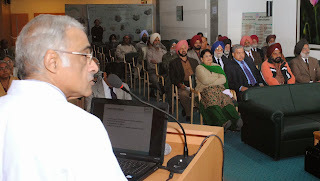 Chandigarh 29th December:---- As many as 100 senior citizens attended a health talk on ''How to deal with hypertension & protect kidneys' at Max Super Specialty Hospital (MSSH) , Mohali today . Speaking during occasion, Dr Vinay Sakhuja, Director Nephrology & Transplant Medicine, MSSH termed hypertension as the 3rd commonest cause of kidney failure worldwide. He said, hypertension affected about 22% of the adult population in our country. In the age group of over 65 years , around 60 % were suffering from this problem. If uncontrolled, hypertension could cause kidney damage and even premature death. In about 90 % of those with hypertension, it was primary indicating that the cause was unknown. This kind of hypertension would often run in families. In the remaining 10% , there was an underlying kidney or endocrine disease, he asserted. Dr Sakhuja said further, one should keep the blood pressure in the target range. The weight control, exercise, and drugs could control blood pressure and prevent or slow the risk of kidney failure. The BP would put a lot of stress on kidneys. Treating BP would help protect the kidneys. Advising the seniors on how lifestyle change could control BP, Dr Sakhuja said that the health of the kidneys was directly dependant on optimum blood pressure in the body. For that one should take plenty of fruits and vegetables and salt intake should be reduced to 5 mg per day. The overweight persons should try to reduce it to ideal level by a combination of calorie restriction and physical activity. Smoking should also be curbed and alcohol intake be reduced, he maintained. During talk , Dr Sakhuja gave following tips to senior citizens for keeping BP in optimum level for healthy kidneys. * Get your BP checked by your doctor regularly. * Lose weight if you're heavy. * Eat more fruits and vegetables. * Limit salt in your diet. * Take your blood pressure pills just as they are prescribed. * Limit use of over-the-counter or prescription painkillers particularly non-steroidal anti-inflammatory drugs (NSAIDS). * Know your own drug allergies. * Ask about a drug's effects on the kidneys any time you take a new medication. Chandigarh 29th December:---- There is a Not for Profit Organization, with a difference functioning in Chandigarh: Cubs Club. Cubs Club is a collection of working mothers who keep organizing activities for the development of children which are the future of our Nation. The Cubs Club organized a unique sale to raise funds and help children from economically weaker sections, pursue their academic careers in higher classes. As part of this endeavor, a 'bake sale' was held at Elante Mall. At this sale homemade bakery items, all of which were made by moms who are members of Cubs Club, were put on sale. Says Ms. Meenu Prashar, Convenor, Cubs Club, "The income generated from this sale will be donated to a Government School for scholarship and stationary for 9th and 10th class students from the underprivileged sections of society." Adds Meenu, "Cubs Club will be adopting at least 10 deserving students of class 9 and 10 of Government School, Sector 11, Chandigarh, for their education. Apart from this the Club will help all students of these classes with basic stationary." Since education plays an important role in development of mind, social skills and has the power to eradicate all evils from society, the Government has very rightly passed the right to education act for all children which provides free education up to Class 8, in Government schools. However, there are many children who deserve and wish to study further but due lack of funds they are unable to pursue their studies. The Cubs Club initiative will surely help such students. Says Ms. Rati Sharma, Co Convenor, Cubs Club, "Keeping in mind the noble cause members of the Club did their bit and prepared delicious items like chocolate top cookies, cup cakes, cone cakes etc. and put them on sale in order to collect funds for the education of financially deprived kids. All these items were homemade prepared by moms in their own kitchens with their own hands, while their kids helped in packaging." Adds Rati, "This way kids also imbibed that satisfaction comes from being part of a process that delivers services to people who desperately need them."